We survived the last supper, the crucifixion, the waiting period, and it is here…the day of resurrection…Easter Sunday! It is not that Jesus lived and died but that He died and lives! Happy Easter. My belief for years has been that when we have faith the size of a mustard seed, nothing will be impossible for us. It was back in the early 1980’s that I read Matthew 17:20: “if you have faith as small as a mustard seed, you can say to this mountain, ‘Move from here to there,’ and it will move. 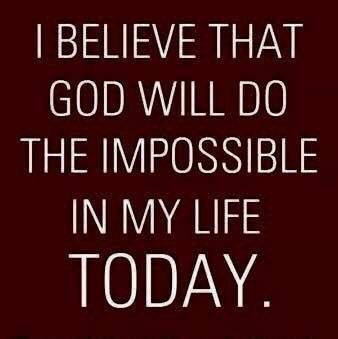 Nothing will be impossible for you.”This scripture implanted itself into my heart and soul and is active to this day. Happy Sunday. Is there anything more comforting in this world than to be able to trust completely? I am starting out my brand new year once again placing complete trust in God because I know that I can trust him with my life and all its happenings. I sometimes get excited waiting to see what He has in store for me next. When we trust in the Lord completely it is not difficult to get excited about what He does in our lives. I have often said to Him, “Lord, I hope you know what you are doing in this situation because I sure don’t.” And lo and behold, the perfect solution is manifested in ways that I never would have expected…or sometimes, even chosen. You’ll never know if life can be trusted until you take the risk of really living. Approach every day of your life with dedication. To gain a fresh perspective on your world, try looking at life through the eyes of a child. Life, even a balanced, harmonious life, was never meant to be static and unchanging. Life offers courage and strength and humor to cope with the inevitable negatives. If you want little gifts of joy in your life…you may actually have to train yourself to notice them. Life, if you have eyes to see the whole picture, brims with meaning, with purpose. I’ll have more Kinkaid quotes in a few days.